Death: one of life’s greatest mysteries, and therefore one of people’s greatest fears. Whilst many peoples and civilisations turn to religion and faith to answer the question of the meaning of life, and the purpose of death, and whether or not life after death exists, the prospect of the actual process of dying causes fear and trepidation. Although we cannot know for sure what the exact experience of death holds for us, many people do take comfort in the knowledge that heaven, or an afterlife, awaits them. Why, therefore, is the prospect of death such a scary one? The Anatomy Lesson of Dr. Nicolaes Tulp, 1632. Oil on canvas, 169.5 x 216.5 cm. Perhaps it is the fear of leaving the known, of leaving people behind, or the fear of pain in passing. Whatever it is, one thing is certain: death is one thing we cannot escape. As Brad Pitt discovered, in his extremely good turn as Joe Black in Meet Joe Black (a straightforward title if ever there was one), the only two things certain in this life are death and taxes. Unfortunately, the probability that death will greet us in the form of Brad Pitt is extremely remote (I’m not giving up hope though…. ), so let us turn away from Hollywood’s interpretation of death, and take a peek at how past celebrities interpreted it. Being an art blog, these celebrities will of course be artists such as Rembrandt and, perhaps surprisingly, Monet. Both of these artists painted death, or dying, as a means of trying to understand what it meant. 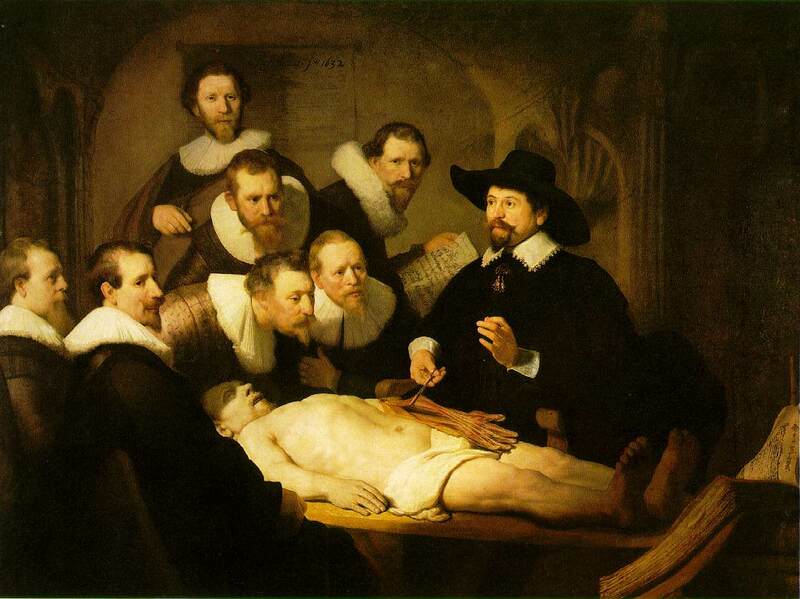 Rembrandt painted his famous Anatomy Lesson as a means to pay homage to both the doctor (Nicolaes Tulp), as well as to the science of dissection. Death had become a teaching tool, allowing others to learn from the bodies left behind. 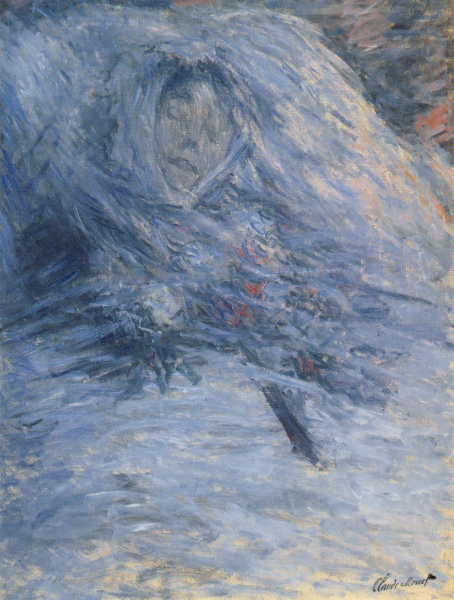 Camille on Her Deathbed, 1879. Oil on canvas, 90 x 68 cm. However, Monet’s interpretation of death is a lot less clinical, and we can really feel the depth of emotion that the artist is putting into his work. Camille on Her Deathbed is a painting of his wife – and it is as if he is trying to come to terms with her passing, and trying to understand why she has left him. It is this emotion which resonates through the ages, and is something which I think everybody can identify with. Ultimately, I think death is something not to be feared, but when life is cut short it is the hardest for those that are left behind. But as we mourn the loss of our friends, loved ones, life-long companions, let us also celebrate the time that we have been able to share together, and be thankful for the privilege of being able to know them. And finally, let us not forget, but keep their memories alive with us. To discover how the mystery of death has been portrayed over the years, the Wellcome Collection, London, is the perfect place to start. Death: A Self-Portrait is the exhibition which is getting everybody talking, so why not find out for yourself what all the fuss is about? On display until the 24th February 2013, this is one collection that you do not want to miss! If you would like to discover more about how the masters treated the subject of death and the afterlife, look no further than Art of the Devil by Arturo Graf. Alternatively, to discover what Rembrandt was all about, check out Harmensz van Rijn Rembrandt by Emile Michel.